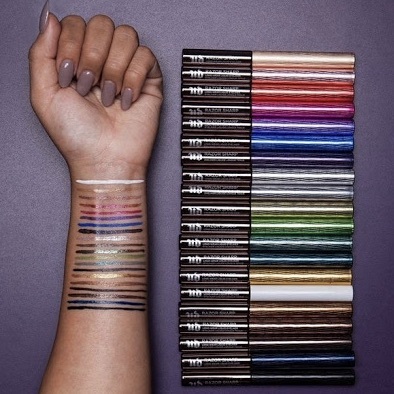 Urban Decay are on fire this year with launch after launch ; first the 30 piece lipstick collection offering matte, semi-matte and satin finish lipsticks, a new NAKED eye shadow palette, an all-night NAKED foundation that has the blogosphere abuzz and now their ‘Razor Sharp’ Eyeliner range boasting 20 metallic shades. However the latest launch hasn’t gone down quite how they’d anticipated and Twitter hit back criticizing the brand for allegedly glorifying self-harm in the campaign imagery. I’m a beauty addict. I love nothing more than trying new brands, new products and reviewing them for my blog. Photographing said products however is a different story. Taking photos of make-up swatches makes me uncomfortable, and I’ll tell you why. I first started cutting myself when I was around 14. I would ‘nick’ my feet and ankles with a razor when I was in the bath and pass them off as shaving cuts. This progressed to very lightly cutting my arms throughout adolescence. Nothing that wouldn’t heal and nothing too drastic to be noticed. Once I was a couple of years into university however I lost control completely. I started making big gashes in my upper thighs where bad English weather meant I could easily hide them and by the end of university I was cutting my left arm. Self Harm is a severe mental illness and manifests itself in the intention to punish oneself, express distress or relieve unbearable tension. I can safely say I wasn't in my right mind. Pressure was building up in my head and my heart and I couldn’t get it out. However there was a very important second element to my cutting. I thought they looked good. At first they weren’t the manic actions of a desperate girl. They were calculated and uniformed and when I would look in a mirror I would hate everything I saw. EXCEPT those cuts. They looked beautiful to me. This is where my discomfort with wrist swatches comes in. Wrist swatches are industry standard now across brands and bloggers alike and that particular part of the body best shows the pigment of the product, its aesthetically pretty ; dainty little wrists and a pretty manicure add to the composition of the shot. If you have ever visited my blog or Instagram you will see I regularly use wrist/arm swatches. My discomfort comes from my own internal correlation between uniformed lines of pretty products and the uniformed lines of cuts and scars I admired in the depths of my illness. Some may say; why use wrist swatches on your blog at all then? You’re following the crowd and adhering to this beauty blogger norm when you say it upsets you, but mainly I still use them because I know my discomfort with the imagery is MY mental issue. It’s MY association. It’s MY illness and it’s the way MY brain registers those similarities. If I shy away from it, don’t confront it or ignore it I’m letting my illness win again. I personally don't have a problem with the Urban Decay Razor Sharp Eyeliner campaign. Yes, the wording is a bit 'dangerous' but assuming the team that came up with the campaign didn't have experience with self-harm or the issues it could correlate too, I don't blame them for thinking it harmless. I don't think we should censor brands based on certain interpretations of the content if the intention was innocent which I honestly think this one was. We should utilise the controversy as an opportunity to have discussions we wouldn't usually, and accept that sometimes a message gets confused. What do you guys think? Are you outraged at UD or are you with me that mistakes happen? If you've not seen the drama, check it here.